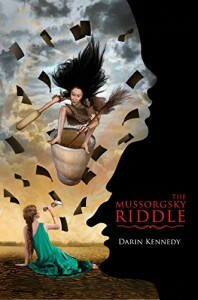 On GoodReads Darin Kennedy, author of The Mussorgsky Riddle suggested to listen to Pictures at an Exhibition whilst reading the book and I can only second that. It plays an immense role in the story and also it's a beautiful piece of music. Mira, a psychic, is called to Anthony. Anthony has been suffering from autism his whole life but has now been even more secluded, not talking to anyone any more and he seems to be lost in his own mind. Mira gets send in to see if she can helped. She then appears as Scheherazade, the famous story teller, in the labyrinth that Anthony has created for himself. He's accompanied by the pieces of Pictures at an Exhibition, the music piece by Mussorgsky. As she travels between the different frames she tries to unravel what's keeping Anthony there. And what has this local missing girl to do with it? It was definitely a unique read. I don't think I've read anything like it before. At the first level it is kind of a mystery, but the use of the music and all the fantasies that arose from it were truly different from the usual book. It was a very interesting read. I don't want to say too much to prevent spoilers, but I would recommend it.